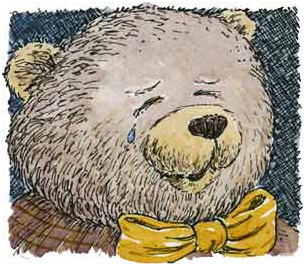 “So am I,” replied Wolstencroft and, although he tried very hard to stop it, a tear rolled down his furry cheek. 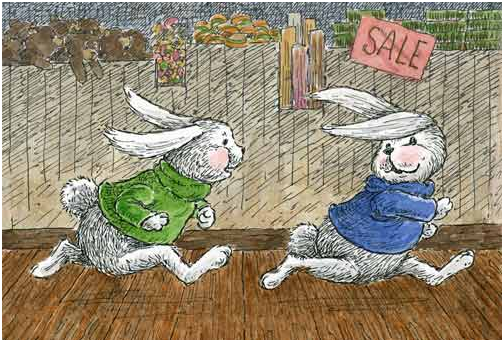 Ronnie and Roger had jumped down off the shelf and were playing tag up and down the aisles. “Be careful and don’t knock anything over,” Rita called to them. Rita looked closely at Wolstencroft from every angle. She peered into his face and circled around him, her nose twitching. He had noticed that bunnies’ noses twitch a lot. Then she sat down and remained deep in thought for a very long time. “It must be your name,” Rita answered. 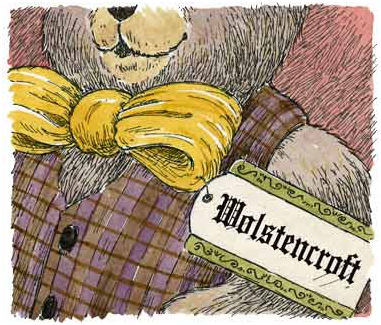 Now Wolstencroft had always been able to say his name correctly. But then, it was his very own name and everyone can say his or her own name. At least he thought that they could. Not when they are very little, of course. He couldn’t say his name when he was a tiny baby bear. But after he had started going to school he knew it very well. And he would name all the letters from A to Z. All 26 of them. He was a very smart bear. On Easter Sunday, very early just after the store had opened, a Mommy and Daddy bought Roger and Ronnie for their twin boys. “They look nice,” Rita said. She was happy that her brothers had found a good home but felt sad, too, because she was beginning to miss them already. At the front of the store a table had been set up with chocolate Easter eggs. And as it was now Easter Sunday, they had been marked down to half price. After everyone had gone home for the day, Wolstencroft picked the nicest egg he could find and gave it to Rita, to cheer her up. They shared the egg, sucking on the sweet creamy chocolate and making sure it didn’t get onto their clothes. Then they started to talk about the name Wolstencroft again. “I wouldn’t want to change it,” Wolstencroft declared. ” I mean it’s me. I’ve had it all my life. 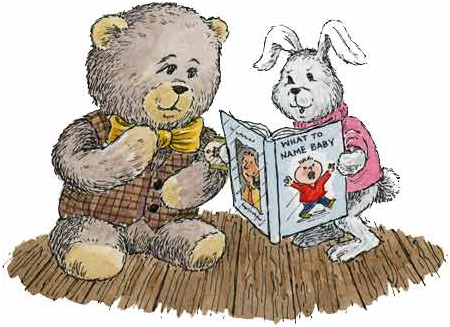 She hopped over to the book department and returned with a book called What to Name Baby. Then she began reading out the names she thought might suit Wolstencroft. But Wolstencroft shook his head. But Wolstencroft was not impressed. So Rita left the B’s and began flipping through the pages of the book, reading out a name for each letter of the alphabet starting with C.
And here she stopped because the names beginning with X, Y and Z: Xavier, Yves and Zachary, were too difficult to pronounce. There was no sense in taking a name that was even harder to say than the one he already had. But Wolstencroft didn’t like any of the names she suggested. At least not for himself. Rita stayed lost in thought for a very long time, tapping her cheek with her finger. And it wasn’t until the big clock behind the pharmacy counter struck ten that she finally spoke. Wolstencroft looked puzzled. “That doesn’t make sense,” he replied. “That’s right,” she cried excitedly. “And you have such a long name that there are several choices.” And she began ticking them off on her fingers. Wolstencroft thought very carefully, mulling over each name in his mind. “I like Croft,” he decided at last. It’s very dignified. They talked it over for well into the night as this was a very important decision. There are very few things as important as one’s name. But finally, just before the dawn rose in the eastern sky, Rita had convinced him that Woolly was the best choice. And so it was that Wolstencroft became known as Woolly for short. 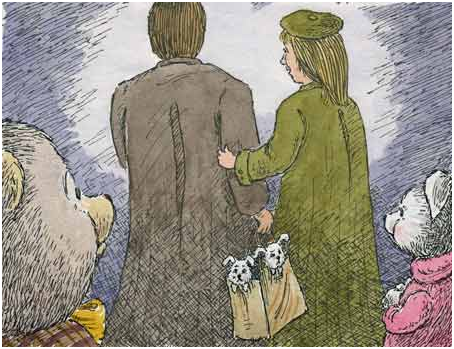 “I bet someone will come along and buy you tomorrow,” Rita predicted as she fetched a black felt pen from the stationery department and underneath Wolstencroft, wrote Woolly for short. But Rita was wrong. It was she, and not Wolstencroft, who went to a new home the next day. Nobody bought Wolstencroft that day. Or the next day. Or the day after that. In fact, all through that entire year, which felt very long indeed to Wolstencroft, nobody took him home to love and to hug him. And by this time he longed to be hugged so badly that sometimes he thought he just couldn’t stand it any longer. Because, of course, no hug is too big for a teddy bear. Soon it was almost Christmas time again. And the tinsel and the holly were decorating the drug store. And the shoppers were all very merry and wearing gaily colored scarves and mittens. But still no one bought Wolstencroft, who was feeling extra sad and lonely sitting there all by himself high above the Christmas cards and wrapping paper. It’s my name he decided sadly, as a tear rolled down his furry cheek. I hate it. And so does everyone else. I wish I were called anything but Wolstencroft. Even though it’s now Woolly for short. Then one frosty evening when the stars were sparkling in the night sky and snowflakes were dancing past the windows, a little boy and his daddy came into the store. And just like Wolstencroft the bear, he was beginning to hate his name. “Why don’t you two get to know each other?” the daddy suggested as he lifted Wolstencroft down from the shelf. And the little boy wrapped his arms around his namesake, which means someone who has the same name as yourself, and stroked his soft fur. And they both loved each other from that moment on. “I love him daddy, can I have him for Christmas?” he asked hopefully. And when his daddy said yes, danced around the store with Wolstencroft, almost colliding with other shoppers as he did so. 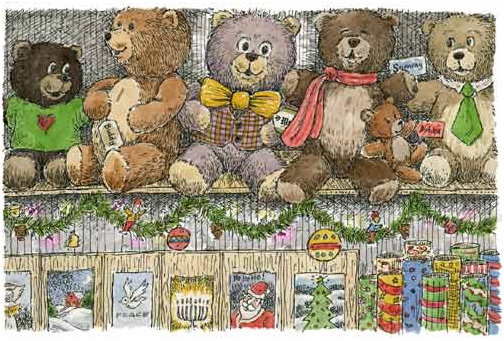 Wolstencroft really wasn’t such a bad name after all they both decided as they whirled around the Christmas tree at the front of the store. In fact, it was starting to sound better all the time now that they had found each other in this wonderful way. 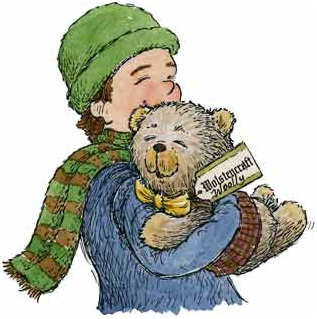 Wolstencroft the bear had never remembered feeling this happy before. Indeed, he felt so chock-full of joy that he thought he just might burst. He was going to a new home at last. And he knew that this little boy, who was called Sten, would be his very best friend forever. Then Sten gave him a hug so big that his tummy was squished. But, of course, Wolstencroft didn’t care. Because no hug is too big for a teddy bear.